There are so many healthy, baby-friendly foods out there, but superfoods are the most nutritious of all. These natural foods are filled with essential nutrients, vitamins, and minerals and they’re easy to incorporate into your baby’s diet. So, I’ve compiled a list of the best superfoods for baby to include on your grocery list, as well as a round-up of recipes your child is sure to love. Just be sure to consult your pediatrician before you introduce any new food to your infant, and only give your baby one new food at a time (wait a few days to ensure there’s no allergic reaction, before you move on to the next new thing). Avocados are a rich source of unsaturated fats, which play a key role in maintaining a healthy heart. This versatile fruit is known for its high nutrient value and can be added to all sorts of dishes, savory or sweet, due to its mild flavor and rich, creamy texture. Potassium-rich bananas are naturally free of fat and cholesterol. This fiber-filled fruit is also chock full of vitamins B6 and C.
Beans and lentils are a great sources of plant-based protein, iron, folate, fiber, zinc, and manganese. To make beans and lentils baby friendly, soak them overnight, then drain, rinse, and cook until very soft. Blueberries contain antioxidants, which work to neutralize free radicals linked to the development of cancer and cardiovascular disease. They are loaded with vitamin C and are an excellent source of manganese, which plays an important part in bone development and converting carbohydrates and fats into energy. Of all the cruciferous vegetables, broccoli stands out as the most concentrated source of vitamin C and contains high levels of calcium and vitamin K, both of which are important for bone health, as well as anticancer phytonutrients. Broccoli is also high in fiber, which aids in digestion, helping prevent constipation. Leafy greens, such as kale and spinach, are major sources of iron and vitamin C. They are low in fat and contain high levels of vitamin K, dietary fiber, potassium, and magnesium. Dark leafy greens are rich in phytochemicals, such as lutein and beta-carotene, which help reduce the risk of cancer, heart disease, and other illnesses. Eggs are easily digestible and are high in iron, folate, and vitamins A and E and are a great source of protein. They’re one of the few foods that naturally contain vitamin D, which helps the body absorb calcium. Greek yogurt has two to three times the amount of protein of regular yogurt and less sugar. Yogurt is a great food to introduce to baby at six months since it boosts the immune system and supports brain and heart health. It’s a good source of calcium and vitamin D and is known to boost immunity and aid digestion. Oats provide high levels of fiber and protein, and low levels of fat. Fiber-rich whole grains like oatmeal digest slowly, providing kids with a steady stream of energy. The high fiber content and the complex carbohydrates slow down the conversion of this whole food to simple sugars, while the high levels of magnesium encourage the body’s proper use of glucose and insulin secretion. Quinoa is naturally gluten-free and incredibly nutritious, containing iron, B-vitamins, magnesium, phosphorus, potassium, calcium, vitamin E, and fiber. It is one of the most protein-rich foods we can eat and is one of only a few plant-based foods that make a complete protein, containing all nine essential amino acids. 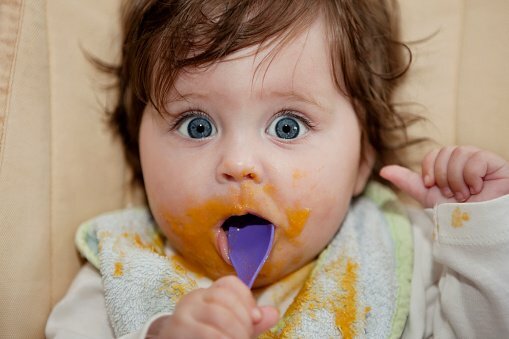 Root vegetables, like carrots and sweet potatoes, make the perfect weaning food because they are naturally sweet and have a smooth, creamy texture when pureed. Their delicate flavour makes it easy to combine them with a variety of different fruits, vegetables, and proteins. Root vegetables, depending on the specific veggie, are loaded with calcium, potassium, vitamin C, and more.